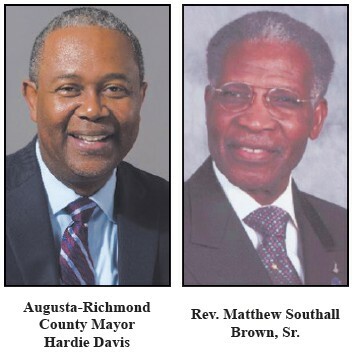 Hardie Davis, the first African American elected mayor of the consolidated Augusta-Richmond County, GA, will be the keynote speaker for the MLK, Jr., Observance Day Association’s 2019 MLK Freedom Gala in Savannah. Also, The Rev. Matthew Southall Brown, Sr., often described as the dean of pastors in Savannah, will be honored with the association’s Humanitarian Award. The black-tie event will be held Saturday, March 23, 2019, at the Hyatt Regency Savannah beginning with a cocktail hour at 6 pm and dinner and program at 7 pm. Tickets are $75. He was sworn in at his second inauguration on Monday, January 7. Davis holds a BS degree in Electrical Engineering from Georgia Tech and a Doctor of Ministry degree from the Christian Life School of Theology in Columbus. In college, he began teaching Bible study, which prepared him to become founder and senior pastor of Abundant Life Worship Center in Augusta. Davis’ career includes 18 years of systems, automation and controls engineering. His public service spans three years as a state representative and five years as a state senator. A distinguished lawmaker while in the State Legislature, Davis chaired the Interstate Cooperation Committee and he was an active member of the Senate committees for Economic Development, Ethics, Finance and Higher Education Senate. He has been recognized for his service by numerous organizations and constituent groups, including Georgia Bio, the Georgia Chamber of Commerce and the Georgia Association for Career and Technical Education. During the first few months of his tenure as mayor, Davis engaged Augusta as a My Brother’s Keeper Community and launched the first Mayor’s Summer Youth Employment Program. He also re-established a college credit-based Mayor’s Fellows Program. He began a Mayor’s Office Hours program to take City Hall to Augustans in informal settings at small businesses within each commission district, making local government more accessible and transparent. Davis is committed to working with small business owners and has hosted Small Business Association officials for roundtable discussions to deliver technical assistance and resources for their operations. Davis is married to the former Evett Plather of Valdosta. They are parents of Benjamin Joshua Davis. Brown, pastor emeritus of St. John Baptist Church – The Mighty Fortress, will be recognized as a humanitarian and visionary for his life’s work in the Savannah community. Brown has been pastor of four churches, and at age 96 he is still actively speaking throughout the community. In addition to his pastorates, Brown is an author, radio host and mentor to other pastors and churches. Corine Ackerson Jones is chair of the Freedom Gala Dinner planning committee. Tickets for the gala can be purchased through March 18,2019, at the MLK, Jr., Observance Day Association’s office, 1206 Martin Luther King Jr. Blvd., Savannah, or online at www.mlkingsavannah.com.